Happy New Year, everyone! I hope everyone's having a prosperous start to 2012, more prosperous than my handicapping contest outcome in 2011 (as portrayed in my new blog header). 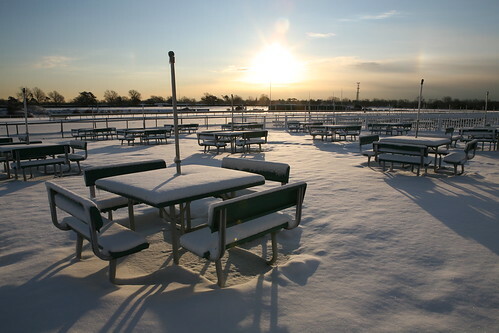 I got a late Christmas present in the form of a press release from Monmouth Park, announcing there will be a Simulcast Series Challenge this winter, with three handicapping contests slated for January 21, February 18 and March 24. Fortunately, none of these conflict with any assistant basketball coaching obligations, weekend trips planned by the Mrs. or things like Valentine's Day, where playing ponies over catering to the wife would, presumably, be frowned upon. I despise winter, especially January and February -- really nothing redeeming about Arctic blasts, but these three contests are among the favorites on my calendar, considering the live-money aspect ($100 entry, $100 bankroll) with the potential to win real money (50% of the pot to the winner, then a sliding scale down for the Top 10 finishers) and the timing in the dead of winter. For those who have yet to participate, the SSC is a must-attend. Save for frugal food credits (usually a $10 voucher...not much, but something), everything is right about these tournaments. The Top 15 in each month's contest advance to a 45-spot April play-in for two National Handicapping Championship seats. I went 0-for-2011 with a break-even performance and one crap-out and am hoping to turn in a better performance this year. If the SSC keeps true to form, players are required to make minimum $10 win, place or show (or a combination thereof) wagers, typically on Aqueduct, Gulfstream and Tampa Bay Downs, for a minimum of 10 races. Tampa, in my opinion, tends to produce the biggest prices and is an excellent handicapping contest track, more so than Aqueduct, though that may change in 2012 with bigger purses. Gulfstream's card is always deep and of high contest quality. Really, the handicapping contest is a wide-open affair, with some 35 races on the card. The hardest part, for me, is patience, considering I seem to find value in every race. Admittedly, however, the only way to win is patience and well-placed big wagers on 1-2 races...picking spots, more or less. It's hard to be patient, but I'm anxiously counting down the days until SSC#1, past performances in hand and ready to stake out a spot in the Monmouth's terrace restaurant, looking out at the dormant track and picturing opening day some four months down the road (hopefully, based on what's going on with track ownership). Otherwise, there's not much contest action to report on my end. I may enter the Horse Tourneys $25 contest on Saturday for a shot at the "Last Chance" tournament in Las Vegas for this year's NHC, but would more or less fly blind and make picks in advance, which I'm typically not a fan of, though my"catch lightning in a bottle mentality" may win out at just a $25 ante with some well-placed long shots. We'll see. Elsewhere, it's a "freebie" for-fun contest, but I'd highly recommend Del Mar's "Winter Meet" contest; it's a great way to practice handicapping skills, with free PPs on a daily race of the day from Santa Anita. Can't make the SSC as I have basketball. We seem to share that interest also. Where do you coach? I coach girls high school. You should check out the handicapping contests at DerbyWars.com. They are really good and inexpensive. I remain tremendously concerned about the 2012 Monmouth meeting. It is only 4 months until May and it will be a disaster if the meet runs for 141 days with purses of $150,000. Andy, where do you coach? I put aside my head coaching hat this season but assist with my son's (3rd grade) and daughter's (4th grade) teams in Tinton Falls. It's just a rec league, but all games are on Saturday, though early enough for me to make SSC#1. I do love working with the kids, though. I've dabbled on DerbyWars.com and think they have the best site, technologically; way above whatever else is out there in terms of what I can access as a NJ resident (4NJBets is a waste). I, too, am concerned a bit about the Monmouth meeting; check out my post from a few weeks ago offering some out-of-the-box ideas for generating interest in the product. There's no way they'll run a 141-day meet (I think a lot of that talk is posturing). I just hope they can find creative ways to give people a product that distinguishes what's going to be the Haskell and a calendar filled with bottom-level claimers. We'll see...lots of time until May.